Disclaimer: The RME ADI-2 DAC was patiently lent to me by their German distributor Hörzone for the purpose of a review. I personally purchased an ADI-2 Pro Anniversary Edition about a year ago that is also featured in this review. Following the huge success of the ADI-2 Pro (reviewed here: https://headfonics.com/2016/12/the-adi-2-pro-by-rme/ and awarded here: https://headfonics.com/2016/12/our-top-gear-for-2016/) by audiophiles and headphone aficionados, RME took notice and started to work on a more streamlined approach for our community. RME actually worked very closely with the hifi scene and listened to a lot of feedback before announcing the ADI-2 DAC. Unsurprisingly this announcement from the end of last year caused some heat. While the ADI-2 Pro remains a versatile studio tool, some of its functions are less interesting for users that are searching for a home DAC/pre-amp/head-amp. Do not make mistakes, the ADI-2 DAC is still fully packed with features and multi-layered menus. The main difference is that RME dropped the analog-to-digital converter and now only has digital inputs. Instead, the DAC now equips more convenient RCA outputs. The ADI-2 DAC is not about slimming down the Pro to its essentials. On the contrary, there are reasons why it should even be a superior choice in most cases. For one, the hardware has been slightly upgraded and the internal SteadyClock now works with femtosecond accuracy. Moreover, the second headphone output has been replaced by a specific 3.5mm ultra-low noise output for the most sensitive IEMs available, pushing the noise floor into benchmark territory. Finally, the DAC comes equipped with a remote. If this doesn’t trigger your upgradetitis yet, maybe the price drop by 37.5 % – just below the magical 1k € line – will make your wallet give in. Anyway, I do suggest to read up on the full ADI-2 Pro review as the majority still holds true for the ADI-2 DAC. The original ADI-2 Pro has a very retro look and mixes a black top with a silver front, adds dark blue frames and then has a nerdy bright green spectral analyzer. I called it back in 2016: “I wouldn’t be surprised if we’d see an all black version next year” and indeed the ADI-2 Pro received a black “20 Years of RME Anniversary Edition” in 2017 (with an awesome see-through top window). 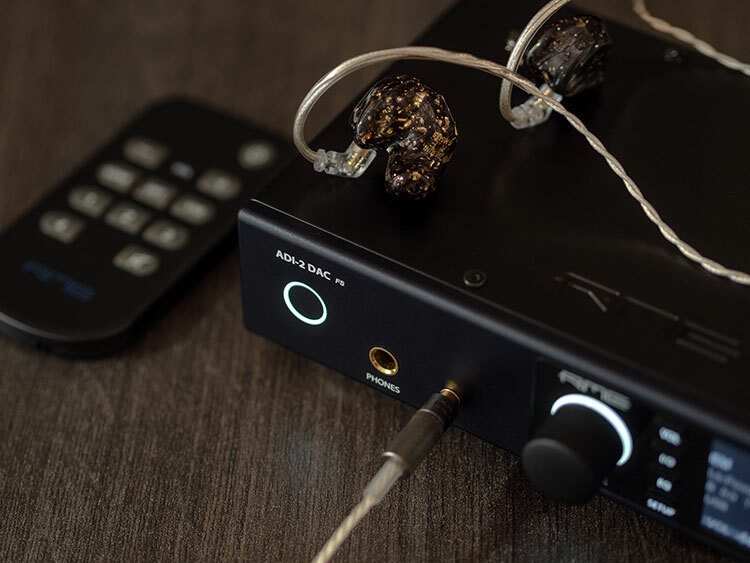 The new DAC uses the all-black front of the Anniversary Edition and slaps it onto the black body of the normal ADI-2 Pro. The all-black design with glowing white lights around the power button and volume knob looks something like an inverted stormtrooper from Star Wars. The presentation is super sleek and the flashy spectral analyzer, while still present, is no longer on display by default. A unique feature of the DAC is to turn display and lights off altogether via the included remote control. This might be very handy if the ADI-2 DAC is part of your home cinema setup and you find all kinds of lights distracting. It took me two weeks to notice the small infrared remote receiver between the bass and treble adjustments, hidden all black behind the display panel. Well done! Build quality is identical for all three versions and thus extremely solid. The device is equipped with gold-plated connections and metal knobs. Only the four front function buttons are made out of plastic (VOL, I/O, EQ, SETUP). A tiny thing that irks me is that the IEM connection does not have the same fully saturated gold color of the 1/4 inch output. Instead, it is silver and has a thicker outline. 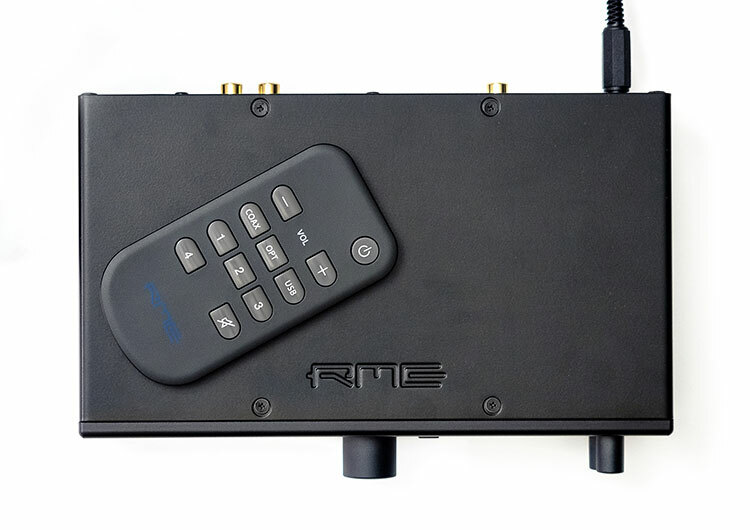 The ADI-2 DAC is the first product from RME that comes shipped with a remote. The remote is slim and lightweight. It is made of plastic but visually still matches the device. The RME logo is set in their trademark blue color, which unfortunately provides little contrast to the background. In a dark room, the remote might look unbranded. I don’t know how it would have been possible, but I would have loved to see the red/ white glowing ring around the power button like on the actual device itself. Anyway, all the buttons work very well. You can use the remote to power on the device too, which isn’t always a given, like with the Chord Hugo 2. To shut off, you have to hold the button for half a second so you don’t accidentally cut off the sound. The other buttons respond quickly and precisely. A longer press imitates an acceleration so it is very easy to adjust the volume in small steps as it is to quickly dial it down. A single click is .5 dB and one second is around 15 dB. This seems obvious, but I have held many remotes in my hand where this did not function as expected. I am sure somebody had to put some trial and error testing into the code to make the remote work as it does and I am once again impressed with the well thought-out details by RME. Input selections are selected with a single press on either COAX, OPT or USB. Beneath that are 4 function buttons that can be configured to your liking in the system menu. By default these are programmed to adjust Mono, Loudness, AutoDark and Dim. Personally, I have replaced Mono with ToggleView. Finally, there is a separate mute button in the lower right. The layout of the button allows easy memory so you can find the button you need without looking. The main accessory in the box is the fully colored manual. It is extremely thorough and explains functions and features in detail without any kind of added mystery or marketing talk. RME show themselves fully transparent and want to make sure the user is not overrun by the many functions of this DAC. For a top-end device, I do miss some cables in the box. The only cables included are the power cable and a USB type A cable. Personally, I am fully equipped with two boxes full of audio and data cables. But if this is the first time you are investing in an external DAC, be sure to put whatever connection you need into the basket before checking out. It’s nothing unusual for amps to have different gain settings. I remember a time when most of them involved opening up the housing and placing jumpers differently on the circuit board. More convenient devices adopted for a physical switch on the back or even front panel. All this is not necessary with RME’s amp. There is an option called AutoRef for auto gain in which the device selects which gain setting is most recommendable. Once the headroom drops below a certain threshold, the device automatically jumps up a gain. It is an internal electronic hardware switch so you might notice the sound drop out for a millisecond but sometimes you won’t even notice it at all. The balanced and unbalanced line-outs have four gains in steps of 6 dBu. A lower gain provides a cleaner signal with less distortion. A higher gain means that the dynamic range is shifted to higher volumes, effectively providing the same signal to noise ratio. The option Auto Ref Lev always selects the best possible SNR depending on the volume dial. The Phones output jumps between low and high power whereas the IEM output is fixed. The ADI-2 DAC features balanced and unbalanced outputs on the rear. You can connect RCA or XLR. It should not be surprising that a standalone DAC would work as a pre-amp – it’s more about the DAC features in the next chapter that make this one special. The line-out does not have a fixed volume. You can lower it precisely in .5 dB steps. The output reaches up to very high 10 Volts but you might want to stay at 90% to make sure you don’t run into clipping. The Phones output with 6.35mm jack is very powerful. 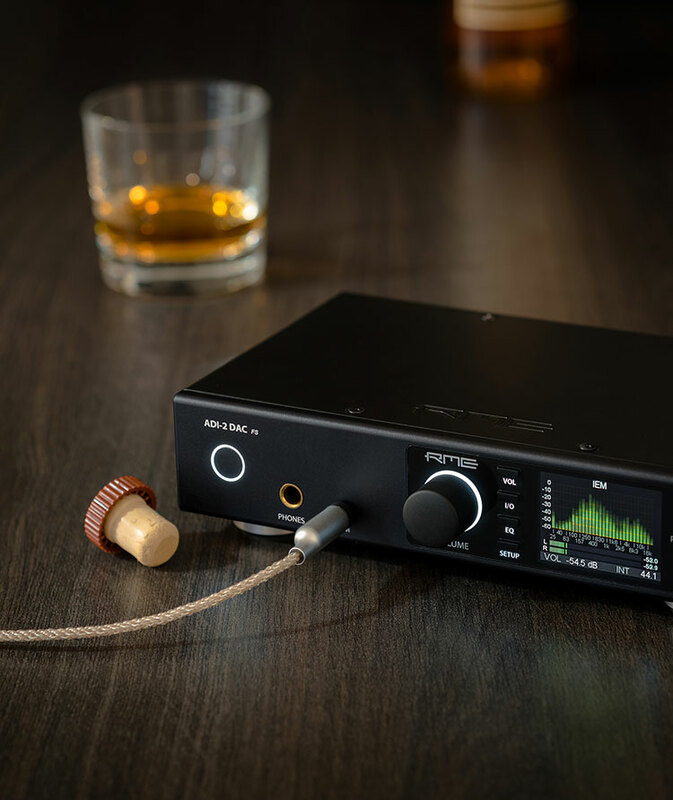 It can easily handle something like the Audeze LCD-2 and also provides enough headroom for the HE-500 or Abyss with wide dynamic Classical recordings. The output impedance is at a very low 0,1 Ω which makes sure that the headphone’s characteristics are not changed. Some people might have hoped for a balanced XLR or 4.4mm output, but at 120 dB channel separation, it is difficult to find any reason for that. The IEM and Phones output are comparable. They have a very similarly high signal to noise ratio but the difference is that the volume on the IEM output is up to 25 dB lower. Effectively, it pushes the noise floor extremely low. In the introduction I mentioned that RME searched contact with the audiophile headphone scene and this is the outcome. The trend for many IEM designers seems to be to push their sensitivity higher and higher. It becomes very difficult to control the earphones’ performance and they also pick up hiss more easily. Campfire Andromeda and Vision Ears VE8 being two examples. RME wanted to make sure that their amp remains future proof should this trend continue. With extremely low THD and an output impedance even lower than the 0.1 Ω of the Phones’, there is basically nothing that would color the IEM or keep it from its full potential. I already find the Phones output impressive in this regard, but I did notice deeper blacks and a larger soundstage with the better suited IEM output. That does not mean that you can’t use the 3.5mm output for larger headphones. The output shows itself severely under-challenged when asked to heat up the Sennheiser HD 660 S or Oppo PM-3. So actually in most cases, it doesn’t even matter which output of the two you use. It probably depends mostly on the cable’s termination that you are using (e.g. 1/4’’ or 1/8’’). What about the iDAC-6 & iHA-6 set? It also costs 1000 bucks. Thanks Klaus. 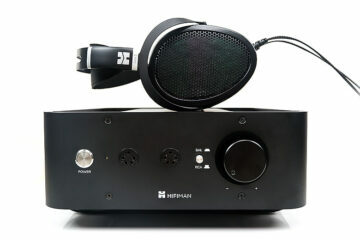 Yes, I was able to find the specs of the Hafler and you are right, it’s probably not great with IEMs. It has a pot to change the load from 20 Ohms to 400 Ohms. I’m not sure what’s the output impedance but Andromedas have an impedance of around 12 Ohms. Thanks again? Hello Jonathan, I am not familiar with the Hafler HA15 and I cannot find any useful specifications about the headphone output. Thus I doubt it will match the performance of the ADI-2 DAC in terms of compatibility with sensitive headphones. As far as I know, the RME is the first desktop amp yet to try to cater to such extreme sensitive IEMs on audiophile levels. The base design is aimed as professionals in the studio, though, so the main headphone output can easily fire up larger headphones like the HD 650. It will be difficult to find an amp that perfectly matches the Andromeda and the HD 650 equally, but if there is any device, I am sure it is the ADI-2 DAC. The EX1000 is not that demanding at all. You could save a lot of money if you only needed an amp for this IEM. Note: Some prefer a less than optimal OI for the Andromeda because the mids sound better with a bent frequency response (between 2-3 ohms) and many like some added midrange distortion for the HD 650 to cover the veil (e.g. use tubes). The RME aims to be a perfect device on its own, meaning the OI is extremely low and of course there is no audible distortion. So your gear will definitely sound different – but it will sound like it is. I cannot say if you actually prefer it. That said, if the budget is 1000 for a desktop solution, I won’t recommend anything else. Thanks for the great review. Have you been able to compare it to the Hafler HA15? I’m looking for an amp/dac to use at home with the CA Andromeda, Sony EX1000, and HD650. Would you recommend the RME at this price point over other options? Did you hear the Sony WM1A DAP, I would like to get a desktop dac/amp and I’m curious about the ADI-2 DAC performance compared to the WM1A.